"Employed by Warminster Urban Council and a typical stolid Wiltshireman, Charles Hudd reported for duty at the central car park at 4.45 a.m on 1st April, 1966. Four other men were at that vantage point when the huge silvery cigar sailed over the green downs in front of them, from west to east. It was high up and made no sound. Just before it reached Cop Heap, where a Saxon chieftain is reputed buried, the aeroform started to stretch into a long poker of white-hot fire. As a crimson glow flooded its entire length, it burst and split in the centre amidships, with a glaring flash of light at breaking point"
Journalist Arthur Shuttlewood charts the activity of the thing. 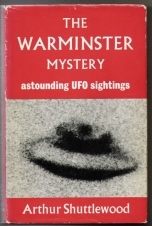 Shuttlewood gives an account of the object(s) seen by the residents of Warminster along with descriptions of the phenomena he encountered during nocturnal vigils in freezing cold woods and from hilltops around Warminster. Initially the thing as it became to be known manifested itself purely as sound, in the middle of the night local people were startled by loud scrapping and banging noises on the roofs of their houses. Eventually the thing became a full blown UFO. Other strange phenomena were recorded in the Warminster area, a gigantic cucumber measuring 30 inches in length and 12 inches in circumference was reported in the Warminster Journal of October 1965. During the period September-October 1965 Arthur Shuttlewood was contacted by three 'space people'. The beings hailed from a world called Aenstria. Traellison was the queen of the Aenstrians, Caellsan the commander of Spacecraft No. 6, and Selorik the English interpreter for Aenstria. Shuttlewood initially believed the calls to be the work of 'slow witted imbeciles'. The space people always contacted Arthur Shuttlewood from a telephone box situated in Boreham Fields, east of Warminster town centre. What may have convinced Shuttlewood not to reject the calls outright as a hoax, was the fact that he never heard the four pennies drop! The space people told Shuttlewood that it would not be a good thing if he were to try and apprehend them, if he did make such an attempt he may come to harm! Nowadays the Aenstrians would be on the O2 or Orange network. Arthur Shuttlewood strikes me as a hugely likeable character, of course he was ever the journalist, he knew how to write a good story. Shuttlewood was central to the Warminster mystery, the question as to whether he engaged in deception over the whole Warminster affair is quite interesting. From reading his books and the various accounts of the Warminster story, I certainly wouldn't describe him as being a cynical individual. I don't believe for one minute that Arthur Shuttlewood thought that he might gain financially. Shuttlewood certainly didn't appear to be motivated purely by the prospect of acquiring 'celebrity status' and or money. He and his associates spent their own money on equipment that would enable them to better observe the supposed UFOs. They spent long nights out on the hills around Warminster in all kinds of inclement wheather. Shuutlewood ended up suffering from heavy colds and bronchial complaints as a result of these observing sessions. The Aenstrians told Shuttlewood that they were concerned with a number of issues that could jeopardise the future of mankind. Atomic warfare, environmental pollution, declining moral standards, drug taking, food full of pesticides and chemicals were seen by the Aenstrians as posing a major threat to the human race. Possibly with the exception of Atomic warfare these issues are still of major concern, probably more so these days. In 2007 issues such as environmental pollution, food full of additives and other unspeakable muck, drug addiction etc, are the focus of a great deal of media attention. Politicians regularly drone on about such matters, I wonder if they actually care about any of this stuff? The 'environment' has become a powerful marketing tool, everyone from banks, supermarkets to car manufacturers are promoting their products or services as being environmentally friendly. This I think really is cynical, it's nothing more than jumping on the bandwagon. Those responsible for commercial advertising campaigns or those in the Government Department of Spin and Propaganda are a fairly unappealing bunch, whatever else is said about Arthur Shuttlewood, he was an attractive character, he had personality. I would have love to have met Arthur Shuttlewood, people might have laughed at him, but irrespective of one's own scepticism, incredulity, he was an extremely engaging man. I think that Arthur Shuttlewood like many others was genuinely looking for something that could change things, something that could prevent the collapse of civilisation and stop the world sliding into chaos and destruction. 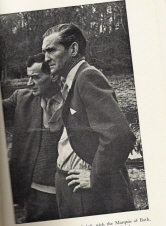 It is interesting to consider that environmental issues were discussed by a number of UFOlogists way back before it become fashionable, indeed quite a number of topics that figured in UFOlogy have been absorbed into mainstream thinking. In a strange way I think Shuttlewood provided those who gathered on Cley Hill throughout the 1960s and 1970s with something valuable, whether you call it hope, or just a way of escaping and experiencing something strange and a bit mysterious I don't know. You can take a hard view and say he merely deluded himself and others, with all that new-age mumbo jumbo. But people need mystery, people need to escape! The following lectures and interviews originally appeared on UFOlogy Across the Ponds, a CD produced by Wendy Connors. Sadly Wendy Connors no longer maintains her website fadded discs. I've uploaded a few interviews and lectures featuring some notable figures from British UFOlogy. A BBC programme Pie in the Sky which examines the strange phenomena at Warminster. Norman Oliver's talk on Hoaxers.